HENDERSON, Nev. – Boris Sapone isn’t your typical personal trainer. Or your typical 27-year-old, for that matter. At 27, Sapone, a strength and conditioning coach, already owns his own gym – complete with a dedicated and growing CrossFit community – and trains the likes of Miss Nevada 2012 and Cirque du Soleil performers. Born in Rome, Italy, Sapone lived in Italy, London, Tanzania and Kenya before settling in the United States. Driven by an enjoyment for fitness that he discovered at Green Valley High School while competing in football, wrestling and track, he became a personal trainer. By 25, he’d earned his bachelor’s degree in health science in kinesiology from UNLV – education that allows Sapone to keep a keen eye on members’ execution of exercises, especially those who come to Colosseum with specific training needs. That same year (2011), he was introduced to CrossFit, which changed his views on fitness forever. In 2010, Sapone began Green Valley Fit Camp, which offered group workout sessions in area parks and included such classes as weight loss boot camp, strength and endurance and core, and kids boot camps. Last fall, Sapone opened his own world-class gym, Colosseum Training Center, and by early 2014, his CrossFit Veni Vidi Vici program was up and running. That community/family-type environment is a consistent thread throughout Colosseum Training Center – in and out of CrossFit Veni Vidi Vici. Members can often be seen encouraging one another and helping one another out. Sapone holds certifications including: CrossFit level 1; CrossFit football; CrossFit kids; CrossFit Power Lifting; and CPR. He also has certifications from the National Council on Strength and Fitness; the National Association of Sports Medicine; the International Sport and Science Association; and the American Council on Exercise. Additionally, he is a performance enhancement specialist; a woman’s fitness specialist; an MMA conditioning specialist; a youth exercise specialist; and affiliated with CrossFit Inc. Located at 3306 St. Rose Parkway, Suite 110, Colosseum Training Center is a fully stocked gym and certified CrossFit gym. Focused on providing a family-like and welcoming atmosphere, Colosseum Training Center offers Fit Camp classes, CrossFit Veni Vidi Vici for adults and kids, Kids Fit Camp, Forza, Sculpt, Female Fit, Power Hour, Kids Fitness, Stroller Camp, Kids Zombie RoundUp, Legionnaire Training, Mobility and Stretching, CTC Gladiator, Young Athletics, Teens Lifting Club and Training Camp. 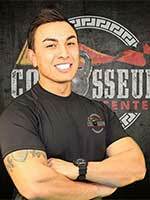 For additional information on Colosseum Training Center, visit colosseumtraining.com or crossfitvenividivici.com or call 702-558-0184.